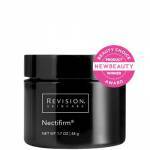 Nectifirm was formulated specifically for firming the neck and décolletage, This incredible product was recently featured on the view with Dr. Doris Day. 96% of patients experienced a firmer neck. This best-selling neck cream contains plant extracts, antioxidants and unique biotechnological blends that work cohesively to create a smoother, firmer, younger-looking neck.